Conflict management resolution is conceptualised as the methods and processes involved in facilitating the peaceful ending of conflict. 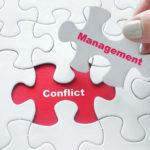 There are many professions and vocations that individuals can be placed in a potential conflict situation that with the correct handling can be dealt with in a calm professional manner. On this course, you will learn how to identify that a situation could arise and how to deal with it to avoid conflict. We offer a full range of classroom courses through our network of over 1000 approved and monitored instructors. Contact us for more information about classroom courses locally and at your workplace. For more information and to view the site visit our Online Course site. We offer classroom courses nationally or at your place of work.